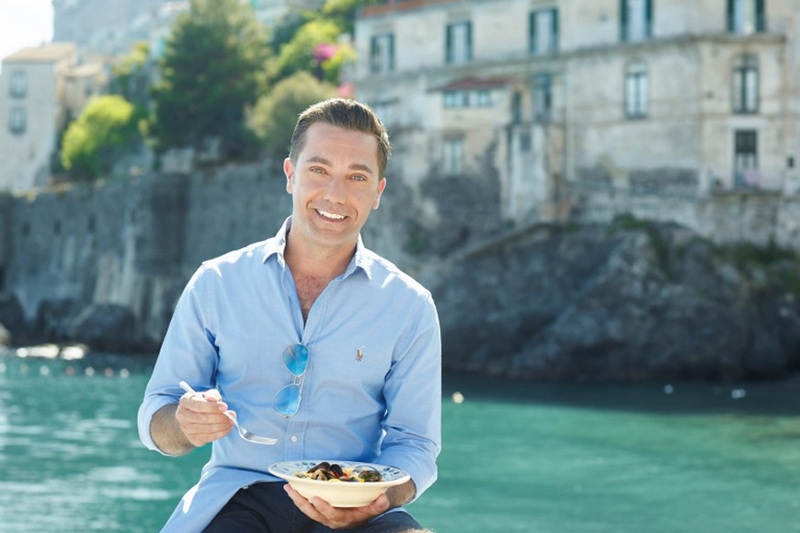 Cheeky chappie Gino D’Acampo is passionate about Italy and his food heritage – hence his last two cookbooks and accompanying ITV series, Gino’s Adriatic Escape and Gino’s Italian Coastal Escape. Your death row meal would be… To be honest, I don’t really care what it is as long as it’s gonna take a hell of a long time to eat! I want to make sure I would last as long as possible. An Italian Christmas meal probably would be the one for me, so I would have five or six hours left! The thing you still can’t make is… I struggle with Indian cuisine because Indian cuisine is about the understanding of the spices. It’s something that I haven’t been brought up with, spices. In Italy we don’t use a lot of spices. Your favourite store cupboard essential has to be… A good bottle of extra virgin olive oil. The kitchen utensil you couldn’t live without has to be… A dishwasher. I hate washing up. If you get hungry late at night, the snack you’ll reach for is… A packet of Wotsits. I’m giving you the truth! Diet or full-fat? Full-fat, but in moderation. I don’t do light. You like your eggs… I like them fried and I like them runny. I hate when they’re hard. Your favourite childhood dinner was… My mother used to make the best spaghetti vongole ever. Last night you at… I had penne all’amatriciana. It’s a pasta with pancetta, onions and chopped tomatoes. I cooked for my wife and the kids, everybody was home. If you were getting take away you’d order… Chinese or Thai. The ultimate hangover cure has to be… There’s nothing better than a fried egg and bacon toasted sandwich. I’ve tried everything. Because you need the protein of the eggs, the saltiness of the bacon and the carbs from the bread. You’ve got everything. You can’t stomach… Anything to do with coriander. I don’t like coriander. I like Thai cuisine, but I don’t like coriander. When there’s any coriander, I hate it. To me, it overpowers the flavours too much. It has a soapy flavour which I don’t like. Your signature dish is… Anything to do with pasta. I don’t have one specific one. Ask me to cook any kind of pasta, I know that I can do it. I have a passion for it. Gino’s Italy Coastal Escape: A taste Of Italy From The Aeolian Islands To Elba, by Gino D’Acampo, is published by Hodder & Stoughton, priced £20. Available online now.